Mario & Wario[a] is a Mario side-scrolling puzzle video game designed by Satoshi Tajiri and developed by Game Freak for the Super Famicom console. The game was released in Japan on August 27, 1993 and requires the Super Famicom Mouse accessory to play. It is notable for being the first Mario game not released overseas. The gameplay of Mario & Wario focuses on guiding Mario, who has various objects placed atop his head by his nemesis Wario, through a series of levels consisting of various obstacles and traps. Because Mario has been rendered sightless and is constantly in danger of walking into hazards, the player controls the fairy Wanda, who can protect Mario by changing the environment around him as he moves towards the levels' end. The game offers a total of 100 levels and offers three playable characters. A player controls Wanda to turn box outlines into blocks in effort to help Mario reach for the "Goal", where Luigi is standing. 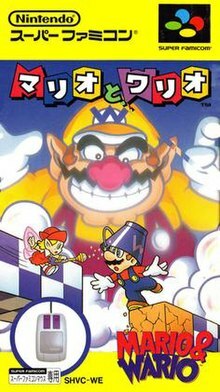 Mario & Wario focuses on Mario, who has various objects, including buckets and vases, placed atop his head by the antagonist Wario. Because the objects render Mario sightless, it is the main goal of the player to guide Mario through each level, which consist of various obstacles and traps, to his brother Luigi, who can remove the offending object. The player must also complete each level within a specified time limit. Because Mario will constantly walk left or right regardless of any oncoming hazards, the player controls the fairy Wanda, who possesses the ability to manipulate the environment in order to protect Mario. Wanda is controlled via a point-and-click interface with the SNES Mouse accessory, influencing objects on the screen when clicked. For example, Wanda can solidify block outlines for use as barriers or bridges for Mario to walk across, and can destroy certain obstacles and enemies. The player can also click Mario to turn him around and reverse his direction. The player is awarded points for defeating enemies, collecting items, and for any remaining time when the level is completed. Extra lives may also be awarded. Mario & Wario contains a total of 100 levels allotted amongst ten unique locales, which include forest, desert, and underwater settings, each with a different offering of enemies or hazards. In addition to Mario, the player can select Princess Peach or Yoshi to be the character that is guided through each level. Princess Peach walks slower than Mario and Yoshi walks faster, which may offer advantages or disadvantages depending on how difficult a particular level is or how fast the player seeks to complete it. Mario & Wario was designed by Pokémon creator Satoshi Tajiri and developed by Game Freak. The game's music was composed by Junichi Masuda. Jon Thompson of Allgame scored Mario & Wario 4 out of 5 stars, praising the colorful graphics and calling the gameplay "entertaining, being fast-paced enough to keep you constantly busy, without resorting to being fast and nearly impossible more than a couple of times." While the game is Japan-exclusive, Mario & Wario was referenced in other Nintendo games released outside the region. The Game Boy role-playing game Pokémon Red and Blue, also developed by Game Freak, alludes to the game: checking the Super NES belonging to a non-playable character displays the message "A game with MARIO wearing a bucket on his head!" This reference returns in Pokémon FireRed and LeafGreen. The bucket used to obscure Mario's vision is collectible both as an item in Kirby Super Star and as a trophy in Super Smash Bros. Melee. ^ a b Peterson, Helen (15 November 1999). "King of Craze Too Shy For Spotlight Pifather Is an Introvert". Daily News. Mortimer Zuckerman. Archived from the original on 15 August 2011. Retrieved 28 January 2010. ^ Thompson, Jon. "Mario & Wario - Review - Allgame". Allgame. ^ Game Freak (28 September 1998). Pokémon Red and Blue. Game Boy. Nintendo. Scene: Saffron City. ^ "Pokémon: Red and Blue Version". NinDB. Archived from the original on 18 June 2012. Retrieved 4 October 2011. ^ "Kirby Super Star". NinDB. Archived from the original on 9 November 2011. Retrieved 4 October 2011. ^ "Super Smash Bros. Melee Guide & Walkthrough - GameCube - IGN". IGN. p. 54. Retrieved 27 September 2011. This page was last edited on 20 April 2019, at 10:28 (UTC).